We noticed a hummingbird in the neighborhood, and so my girlfriend put up a hummingbird feeder on Thursday. The results: we now see hummingbirds there at least a half-dozen times per day. Which is amazing. They are such delicate little sugar spazzes. I adore them and count my visit to the Arizona-Sonoran Desert Museum Hummingbird House one of the most memorable things in my life. 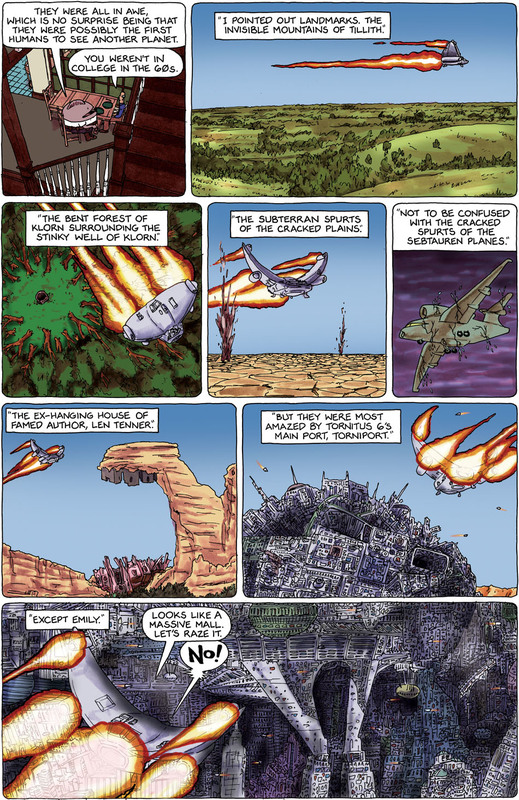 Today’s strip is NOT like Arthur C. Clarke’s “Rendezvous with Rama” but it certainly pulled some inspiration from it. I was first introduced to Clark by seeing, and then reading, “2001: A Space Odyssey .” His characters are plain (in a way that reminds me of Hemingway) with not a lot of personality, and he doesn’t go much into their life story, but they are solid real people doing their jobs. Which helps us directly experience the awe and wonder of what Clarke creates. With a character based story, the experiences are filtered through the character’s eyes, teaching the reader how to feel by showing reactions, rather than leaving the reader alone in their wonder. But if the author keeps their characters impersonal, the reader is allowed to step into the world themselves. Mind you, I LOVE LOVE LOVE character-based stories, I am merely pointing out why I ALSO love stories like this (I’ve already reserved the sequel at the library). So, “Rendezvous with Rama,” basic story without giving away too much: humans find a huge alien spacecraft in the shape of a cylinder. They investigate, and what few questions they manage to answer mostly just open up more questions. How it relates to today’s Spacetrawler? I wanted to portray somewhat the awe my characters are feeling, and I think it helped to not show them. Get ready for a lot of character-getting-in-the-way-of-the-story in Rama II. If I were to pick a Clarke story that “Spacetrawler” reminded me of, it would have to be “Rescue Party.” There really isn’t much resemblance so far as plot, it’s just the notion of aliens finding their manipulative appendages full when trying to deal with humans. As someone who adores Rendezvous with Rama and then went on to read the next 3 books written with Gentry Lee (Clarke never originally intended the story to continue, btw), and as someone who is your friend, may I entreat you to think seriously about not continuing. The awe, I believe, is the point of that first book, and the next three attempt to explain everything. Both my Dad and I were both disappointed with what they came up with. I think we forget that “alien” doesn’t necessarily mean we get the answers, and I think the follow-ups did the original a disservice. This is merely opinion, of course. Gentry Lee’s contribution was exposition . . . or else they both needed a good editor. What I love about Clarke alone is that there are never unnecessary paddings. His work is deceptively simple because it’s concise. And while there are things to enjoy about the sequels in the way of ideas, as a lover of stories, I beseech you to consider leaving yourself in the mystery and alienness and come to your own conclusions about the larger meaning that RwR concludes on. Holy Bleeping Censored! You weren’t kidding when you said you needed a lot of buildings! You know, it just occurred to me that there must be a lot of buildings you can copy if you buy SimCity4 and its Building Architect Tool (BAT). I’d love to point you at some, but my copy of SimCity was lent to me, so I can’t download the BAT; and I’ve never built a city big enough to get 100-story office buildings, so I don’t know what they look like. As for the rest, love the landmarks. All of them. I’m tempted to look for a place to use one of them for a humor effect. Also, I like how you took the trouble to create a complex planet that is not all forest, not all desert, and not all city. The Invisible Mountains of Tillith wouldn’t be a reference to Minas Tirith by any chance? Or is it to the mountain that was “disappeaeared” in The Hitchhiker’s Guide to the Galaxy? (I can point you to the specific MP3 of tHGttG if you want.) Or (gasp) George of the Jungle? Herb, Matt, I’ll do my best to cancel my request, although it’s interlibrary loan, so it might be too late. And… well…. I might be too curious despite the knowledge of assured disappointment. The Invisible Megamountain Magramal is mentioned in The Hitchhiker’s Guide radio play, Tertiary Phase, Episode 14 spanning minutes 10:29 through 11:34, as part of the discussion on SEP’s (which starts at minute 8:48) . Episode 14 is the one that starts with Arthur and Ford flying through space-time clinging to a Chesterfield Sofa (for the people who haven’t read or heard The Hitchhiker’s Guide before, don’t worry if you have no idea of what I’m talking about). I’d love to point you to the point of Life, The Universe, and Everything where it appears, but I never managed to get my hands on the book (I know which book it is, because I checked the spelling of “Magramal” on Wikipedia, and it says the book it appears in, in its article there). The invisible mountains in George of the Jungle are much simpler concept: a plane flies into a cloud, there’s a small crunch, and the plane comes out the other end without its wings. The cloud dissolves revealing two mountain peaks that were exactly separate enough to let the plane fly through their pass, while leaving its wings behind. Chapter four, starting on page 26 in my version. One of my favorite books EVER!!! Right up there with Childhood’s End and Transfigurations (Michael Bishop). Great strip – Just found it and started from the beginning. Reminds me of the missing mountains in Hindu scripture only they aren’t mountains in the conventional sense. Huge mostly unseen yet are stairways to other dimensions.